When Rachael saw the frog, she followed it. It was multi-coloured and had the most gorgeous hues in its skin. There were blues and greens, bright red and gorgeous purple and the colours looked as if they were made of jewels. As it hopped, it looked as if it wore a rainbow on its back. She followed it, was drawn to follow it. She felt a little bit like Alice in Wonderland following the white rabbit and look at the trouble that Alice got into with that; but it didn’t matter. She was powerless not to follow it. It was a while before she looked up around her. Rachael had never been in this part of town before and didn’t recognize anything. She only hoped she would be able to get home. The jewelled frog hopped down an alleyway and she followed it again. When she came out of the alleyway, she was amazed at what she saw. A mirror stood in the centre of a field. Rachael could hear the grass whispering in the breeze; almost as if it were whispering in excitement or knew she was there. She watched as the frog hopped up to the mirror and then hopped into it. It was as if the mirror were made of liquid silver. It swallowed the frog whole. Rachael didn’t think, she just ran towards the mirror. 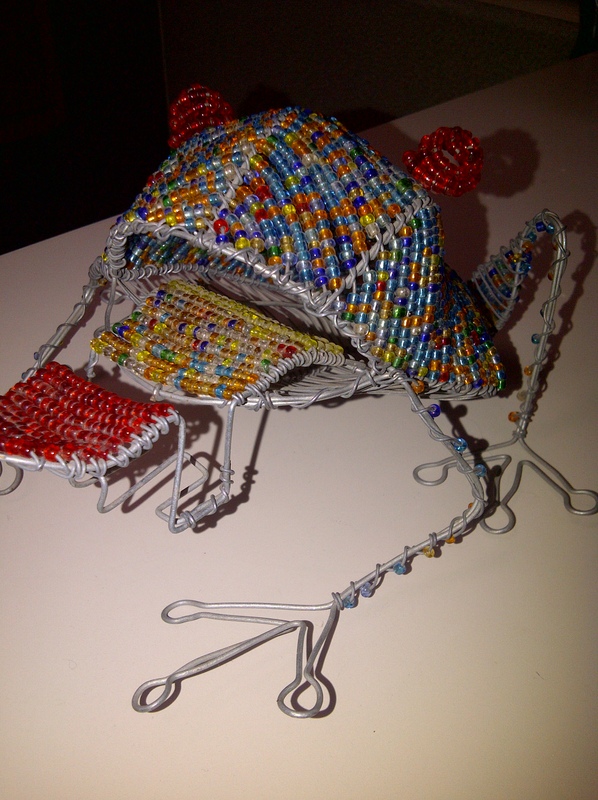 The beaded frog was the most colourful thing she had ever seen and she didn’t want to lose it. Rachael was a foot from the mirror when the whispering grass increased in volume, its sounds almost deafening. The mirror was also filled with a bright, pure light and it shone brighter than the sun. In the mirror, she didn’t see herself. She saw a land of grass, trees and water. The brightness coming from the mirror was actually coming from the sun that shone. Rachael wanted to be surrounded by that brightness, so no thought was required. She went to step through the mirror. It was as if it reached out to take hold of her. The liquid mirror was warm and soft and closed over her. There was a moment of darkness but when it cleared she was in the land she had glimpsed in the mirror, with on crucial difference. Instead of the frog, there was a woman in front of her. At least, Rachael thought it was a woman. She was wearing a beautiful dress in a dark brown hue and white stitching. Rachael took a closer look at her and realized the woman was not wearing a dress-she was made of fabric. “I’m so glad you made it through the mirror Rachael. You followed my frog.” The woman bent down to pick up the frog, her body whispering like the grass. “You did it without any hesitation, I’m so proud of you.” When she stood, Rachel saw that the the frog had become part of her dress. “You’re made of fabric.” Rachael pointed out. Rachael sat at the table and saw something she hadn’t before: a tea pot, made out of more of the same fabric, was sitting there with two cups on either side of it. Rachael sat as Schway Schway poured the tea. Rachael expected to see more fabric pouring out of the spout, but tea poured out and filled both cups with a rich earthy smelling tea. Taking a sip, she found her entire body warmed all the way through. “This is very good!” Rachael said. Blackness came then and Schway Schway and the mirror world disappeared. When she opened her eyes and looked around her room, Rachael was in her bedroom, in her bed, surrounded by all of her things. Everything was different however because she saw the world in a different way now. She went to get out of bed but noticed something sitting on her bedspread. It was a broach, shaped like a frog. Looking at it, she knew it was her frog, Schway Schway’s frog. It had the same markings and the same beautiful jewel toned colours, each a small bead that shone like the light of a rainbow. Picking it up, she saw a note was pinned to it. It was two words written on a piece of fabric that she thought might have come from Schway Schway’s dress. The note read: Dream big. Rachael felt warmth run through her, almost as if she’d had another sip of the dream tea. She knew that from now on, she would start living her dreams and the thought didn’t terrify her. It filled her with excitement. “Dream big.” She said out loud. She pinned the frog broach to her nightgown and got out of bed. She would look through the want ads for parts in musicals or choirs, anything she fancied. Rachael smiled as she went to the kitchen to find the paper. She would start making some of her dreams a reality. They may only be dreams, but they were hers. She would stop holding on to regret and start living. Rachael would dream big and anything was possible.